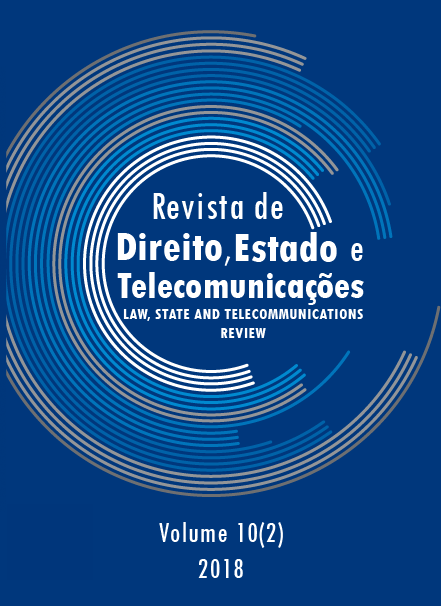 We are pleased to introduce the tenth volume of the Law, State and Telecommunications Review (LSTR). In this issue, the journal published a number of original articles on topics relevant to telecommunications from a myriad of interdisciplinary perspectives. We are delighted to include articles on Internet penetration in Mexico, electoral hacking and neutrality in Colombia, cybercrimes, charges and ICT, software development, and Law and Technology. For future issues, we will continue to publish articles on all relevant areas of telecommunications. We hope you have enjoyed reading the first decade of this journal, and we look forward to an eleventh volume to be released on May 2019. BOARD, E. Table of Contents. Law, State and Telecommunications Review, v. 10, n. 2, p. i-xii, 5 jan. 2019.